WELCOME TO THE MILL CREEK CREATIVE BLOG! Use the search bar and category tags to find the content your looking for. Want to see a post on something in particular? Email us your ideas to jessica@millcreekcreative.org! 2. Create a Title for Your Post. WordPress blog posts titles should be between 40 and 70 characters. Keep in mind the content of your post and choose a certain key word or key phrase (also known as a focus word) that describes what your post content will be about. For example: say your post is going to be about essential oils and what they can be used for. You will want your post title to be something like “Essential Oil Benefits for Your Health and Your Home.” (The key phrase being “essential oil benefits”). When deciding on a keyword or phrase, keep in mind phrases that might be typed into search engines to find content like your post. If you’re having trouble figuring out a good focus word check out the free Google Adwords: Keyword Planner tool (requires free Google account). If you want to check and see if your headline will grab someone’s attention try out this free headline analysis tool from CoSchedule. 3. Modify the Post URL. 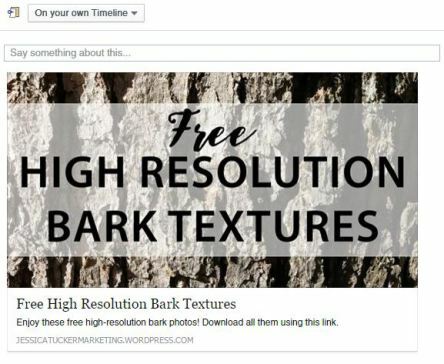 Once you’ve typed in the title of your post, WordPress will automatically assign it a URL based on the post title. You can change this to help its SEO. You would want your URL to contain that same key phrase you’ll be using in your title and post content. Take for example the Post Title above. WordPress will automatically make the URL something like “www.myurl.com/2016/01/5/essential-oil-benefits-for-your-health-and-your-home.” It’s not necessary to have all the title in the URL, so you can change it something that is shorter and more beneficial to your SEO. If your key phrase is “Essential Oils Benefits,” you would want your URL to be myurl.com/posts/2016/01/5/essential-oil-benefits. (If your Post Title is just strictly your key phrase then you won’t have to change it, but if you have other words in there you will need to change it). Click the "Edit" button next the URL to modify it. The first sentence of your post should be typed in the Heading 1 Style. It should reflect the title of your post and should also contain your key word or phrase. To continue with our example, I would make the first sentence (in the Heading 1 style) read “Essential Oil Benefits for Your Health and Your Home.” Then press enter to go down to the next line and type “Essential Oil Benefits range from improving overall physical health, mental clarity and more.” The second sentence should be in the “Heading 2” style. The H1 and H2 styles are very important in regards to search engine optimization because they are the one of the first things that search engines look at to determine what a post or page is about. This is also helpful for telling your readers the same thing. You can use the other heading tags throughout your post, but the H1 and H2 tags should be your priority. 5. Content Length & Key Word Usage. Now that your main headings have been written you can move on to the the rest of your post content. The entire length of your content should be more than 300 words, but less than 1,000 words. Unless you’re writing an academic paper, there’s really no need to write that much. To find out more about why content length is important, check out this article from serpIQ. 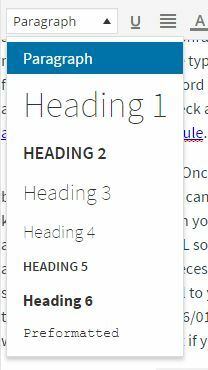 WordPress offers a word counter at the bottom of their text editor. It can be helpful for tracking how many words you have written. Remember to use your key word or phrase through the content of your post. This can be a bit tricky for some people because you want to make sure it’s included organically throughout the text. Using a word or phrase organically simply means that the placement of the key word or phrase makes sense within the context it’s used. You don’t want to put it into every sentence or in sentences where it doesn’t make sense. As Google phrases it, “repeating the same words or phrases so often that it sounds unnatural.” There’s not really a magic number of times you should use the key phrase but I would shoot for ten or more times. 7. Use Images. Images are a great way to break up long paragraphs of text and engage your reader visually. Make sure the pictures you use are relevant to the content you’re posting. With our example posting images of essential oils, essential oil plants, etc., would be appropriate images. You also want to make sure you have the rights to the images you’re using. It’s always best to take your own pictures, but if you can’t then make sure the images you use aren’t copyright restricted. There are great websites our there for downloading free commercial use photos like Pixabay. You can optimize images for search engines in several ways. There are several tricks you can use that will help boost the search-ability of your blog images. When you upload a new image to WordPress it will show you the following options: You should see the “URL” space which is the URL of that specific image (given to it by WordPress). Below that you should see a space for the image title. Typically when you upload the image WordPress automatically assigns the title as whatever you had the image named on your computer. You can change this if necessary. Again you’ll want to keep in mind your key word or phrase. You can also add a caption, which will show beneath the photo on your post. It’s not always necessary to use a caption, but you can add one if you like. 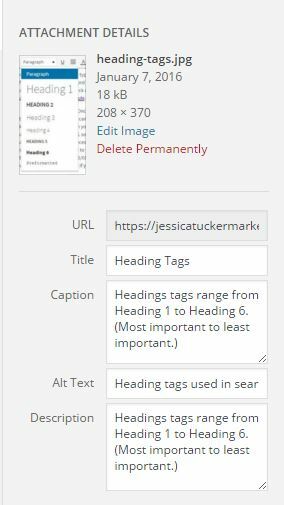 The next space you can fill in is the “Alt Text.” The alt text is extremely important; search engines can’t visually “see” images on a website, so the Alt Text is what they use to determine what an image is depicting. It’s important that your Alt Text is an accurate description of what the image contains, and that it also uses the key word or phrase when applicable. You want the Alt Text to be short and simple. The last space you can fill in is the Image Description. This is where you can post more text describing the picture and the topic. When you share the image on social media the open graph software will typically pull the information from the alt text and description. 8. Categories. After you’ve finished typing your body content, you’ll want to choose the category(ies) for your post. If you’ve been blogging before you’ll most likely have your categories already set up. Pick the one that is most relevant to the topic of your post. The purpose of categorizing your blog posts is to make it easier for reader so search for content from a single topic. 9. Create Tags. You can also add “Tags” to a post that act as little descriptors for your post. This is not as important as it used to be, now that Google has placed less importance on meta keywords rather than keywords placed organically through page/post content. The main purpose for these tags is to have another way to make it easier for readers to find posts on a certain topic. For our essential oils example, some tags I might choose are “essential oils” “natural healing” “holistic health,” etc. Facebook’s featured image size is 470×246 pixels. If you don’t use a featured image, then it will show a link. I recommend using a featured image because it can help grab people’s attention when scrolling through their timelines. For WordPress.ORG users only: If you are self-hosting your blog I highly recommend downloading installing the Yoast SEO Plugin(it’s free with optional paid premium version). It will help you keep you on track with all the things I mentioned above. You can also edit how your blog post will show up on search engines and when shared on social media sites. It’s definitely worth using. 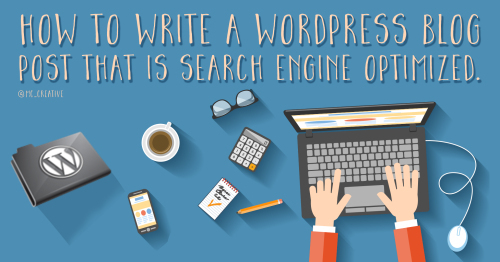 So there you have some helpful tips about how to write a WordPress blog post that is search engine optimized. If you want to learn more about the basics of search engine optimization click here. Thanks for reading and don’t forget to like this post and share it! Mill Creek Creative is a creative agency in Middle Tennessee helping local businesses with graphic design, websites and marketing.